Following on the hellishly-hot heels of the Doom reboot, there are potentially plans to resurrect the original Quake. ZeniMax Media, the parent company of Bethesda and id Software, has posted a number of job listings which point to the fact that a reimagining of Quake could possibly be on the cards. Techspot noticed the advertised positions for id Software in Frankfurt and Dallas which are searching for folks to "work as part of a development team on legendary id game properties like DOOM and QUAKE, developing custom tools and technology for the game industry's most advanced engine technology". The positions include a lead gameplay programmer, art supervisor, senior lighting artist, senior physics programmer, and a senior tools programmer. Of course, this is hardly definitive evidence of a Quake reboot, but given the positive reception the new Doom game has received (multiplayer aside), it has to be a possibility. 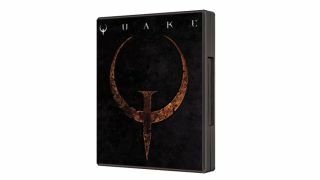 There hasn't been a Quake game for some time now: Quake 4 was released way back in 2005 (developed by Raven software), then Enemy Territory: Quake Wars – a prequel to Quake 2 developed by Splash Damage – followed two years later, but we've seen nothing since then. Of course, Quake 4 emerged a year after Doom 3 using the same id Tech 4 engine, so we could possibly see history repeating itself with Quake again following Doom, and this new Quake reboot potentially reusing the same engine. If there is a reboot of the original Quake, however, let's hope it's not too faithful to the game's single player episodes. While they were nicely spooky and atmospheric in places, we remember finding the overall experience disappointingly pedestrian at the time. Particularly the boss encounters – Shub-Niggurath gets our vote for the worst final boss monster ever. The thing is, Quake was never about the single player though – it was really all focused on the deathmatch, with a truly 3D environment and the introduction of mouse-look, along with the physics, particularly with rockets (splash damage, aiming at the feet of your opponents, not to mention rocket jumps). Quake deathmatch, plus QuakeWorld and the expansion of online play – and the first 'pro gaming' stars, remember Thresh winning that Ferrari? – this was why the title was revolutionary for PC gaming.